The same period, however, saw no successful trials against nonmetastatic CRPC, so the number of proven treatments remained, at least in the opening months of this year, where it had begun in 2004: at zero. Patients with the localized form of CRPC (FIGURE) still have no options that are proven to extend overall survival (OS), but preliminary results from the PROSPER trial of enzalutamide and the SPARTAN trial of apalutamide (Erleada) offer them unprecedented hope. Both drugs, used in conjunction with androgen deprivation therapy (ADT), have demonstrated the ability to delay the metastasis that ultimately kill patients with prostate cancer by an average of about 24 months. These 2 trials may be remembered as the first in a long line of breakthroughs against nonmetastatic CRPC. The FDA approved both apalutamide and enzalutamide for patients with nonmetastatis CRPC in February and July 2018, respectively. Other experimental compounds are currently being tested as monotherapies against the condition, and both enzalutamide and apalutamide are being tested as part of experimental combinations. Nothing is guaranteed just yet, however, not even the wisdom of using enzalutamide or apalutamide against nonmetastatic CRPC. “Although it’s clear that there is [an] unprecedented delay in the development of metastasis with the use of enzalutamide or apalutamide in patients with nonmetastatic castration-resistant disease, we can’t be certain that we are prolonging life until we see the final overall survival results from PROSPER and SPARTAN,” said Maha H. Hussain, MD, the lead investigator of the PROSPER trial, in an interview with Targeted Therapies in Oncology. The years that followed saw half a dozen agents approved for metastatic CRPC, but few of those were tested in the setting of nonmetastatic CRPC. Radium-223 and external beam radiation all treat cancer in the bone, so there was little push to test them in patients whose cancer had not spread to the bone. Observers can only guess why the others were never tested in nonmetastatic CRPC. In Enzalutamide and apalutamide seemed likely to help such patients because they both block the androgen receptors that somehow develop castration resistance and resume their ability to drive tumor growth, despite the lack of androgens in patients who continue on ADT. Both drugs also had fewer adverse effects (AEs) than chemotherapeutics. PROSPER and SPARTAN both started in October 2013, but they were not the first trials of anti-androgens against nonmetastatic CRPC. 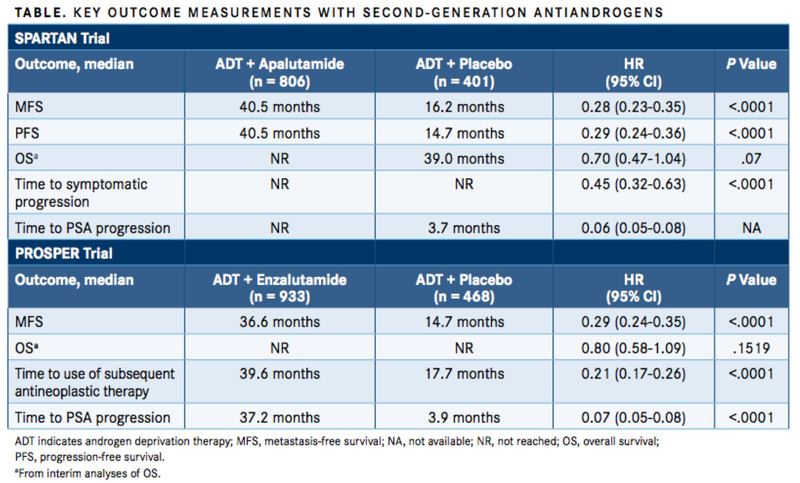 PROSPER and SPARTAN, which both tested second-generation nonsteroidal anti-androgens, have reported better results to date (TABLE). As of June 28, 2017, 219 of 933 patients (23%) treated with enzalutamide and 228 of 468 patients (49%) treated with placebo had either developed metastasis or died. The median MFS was 36.6 months in the enzalutamide group versus 14.7 months in the placebo group (HR for metastasis or death, 0.29; 95% CI, 0.24-0.35; P <.001). Nearly half of all patients on placebo but just 15% of all enzalutamide patients had moved on to subsequent antineoplastic therapy by data cutoff, and the median time to such therapy was 39.6 months for patients treated with enzalutamide/ADT and 17.7 months for patients in the ADT-alone arm (P <.001). PSA progression occurred in 22% of patients in the enzalutamide group versus 69% with placebo. The median time to PSA progression was 37.2 months in patients treated with enzalutamide and 3.9 months in those treated with ADT alone (P <.001). Although patients in the placebo arm were far more likely to progress than those treated with enzalutamide, they were not significantly more likely to die as of the data cutoff date. At the first interim OS analysis, 103 patients (11%) who were treated with enzalutamide and 62 (13%) with placebo had died. These results have so far been similar to those from the double-blind phase III SPARTAN trial. Current published data come from a planned primary analysis that occurred after 378 instances of metastasis or death. The median MFS was 40.5 months in the apalutamide group and 16.2 months in the placebo group (HR for metastasis or death, 0.28; 95% CI, 0.23-0.35; P <.001). Numbers were almost identical for median time to metastasis and median progression-free survival because most of the events were from the development of metastatic disease, not death. The median time to PSA progression was 3.7 months in the placebo group but it was not reached in the apalutamide group (HR, 0.06; 95% CI, 0.05-0.08). The preliminary analysis did not show a significant increase in OS, which was a median of 39 months among patients receiving placebo and was not yet reached among patients receiving apalutamide, but the calculation was close (HR for death, 0.70; 95% CI, 0.47-1.04, P = .07). The preliminary SPARTAN data were enough for the independent data and safety monitoring committee to unanimously recommended more than a year ago that the trial be unblinded and that the patients in the placebo group be given the option to receive apalutamide. Subsequent sub-analyses from the trials have been presented at conferences, and the news has been favorable. Of course, both of those analyses are necessarily speculative. It would probably take several large trials that improve both MFS and OS in highly correlated ways to know that the first is a good proxy for the second and to infer deaths prevented from improvements in MFS. What to Do With These Data? Further data from both PROSPER and SPARTAN should answer some important questions, but those 2 trials aren’t the only hope for further clarity on optimal treatment strategies. There are also dozens of smaller trials going on, too, testing different treatments in many combinations on patients at every point in prostate cancer progression. For example, the National Cancer Institute currently lists 21 ongoing trials that combine apalutamide with different forms of medication, radiation, and surgery, and another 49 trials using enzalutamide. There’s also increasing interest in using immunotherapies besides sipuleucel-T against CRPC. Investigators made news at this year’s ASCO Annual Meeting by announcing some results from a trial of pembrolizumab (Keytruda) in 258 patients with advanced CRPC who had failed all other treatments. In KEYNOTE-199, approximately 40% survived a year and 11% experienced disease control for at least 6 months.17 Not many other trials of immunotherapy against advanced prostate cancer have made as many headlines, but dozens of such studies are currently underway. “There’s been, and continues to be, true excitement within prostate cancer research,” said Neal D. Shore, MD, medical director for the Carolina Urologic Research Center, who was an investigator on the PROSPER trial. “After many years of failed combination trials for castration-resistant disease, after the approval of docetaxel, we’ve had 7 approved CRPC therapeutics within the last 8 years. Now we have 2 newly approved drugs that have shown the ability, on average, to delay metastases for approximately 2 years. “These 2 newly approved therapeutics, enzalutamide and apalutamide, may also be well suited for combinations with other medications, radiopharmaceuticals, immunotherapies, or other novel oral antineoplastics, such as PARP inhibitors, EZH2 inhibitors, etc. We continue to strive to accomplish survival prolongation, quality-of-life preservation, and complication prevention for our patients [with advanced cancer]. Ritch CR, Cookson MS. Advances in the management of castration resistant prostate cancer. BMJ. 2016;355:i4405. doi: 10.1136/bmj.i4405. Huggins CB, Hodges CV. Studies on prostate cancer: 1. The effects of castration, of estrogen and androgen injection on serum phosphatases in metastatic carcinoma of the prostate. Cancer Res. 1941;1(4):293-297. cancerres.aacrjournals.org/content/1/4/293. Huggins C, Stephens RC, Hodges CV. Studies on prostatic cancer II. The effects of castration on advanced carcinoma of the prostate gland. Arch Surg. 1941;43(2):209-223. doi: 10.1001/archsurg.1941.01210140043004. 4. Denmeade SR, Isaacs JT. A history of prostate cancer treatment. Nat Rev Cancer. 2002;2(5):389-396. doi: 10.1038/nrc801. Tannock IF, de Wit R, Berry WR, et al; TAX 327 Investigators. Docetaxel plus prednisone or mitoxantrone plus prednisone for advanced prostate cancer. N Engl J Med. 2004;351(15):1502-1512. doi: 10.1056/NEJMoa040720. de Bono JS, Oudard S, Ozguroglu M, et al; TROPIC Investigators. Prednisone plus cabazitaxel or mitoxantrone for metastatic castration-resistant prostate cancer progressing after docetaxel treatment: a randomised open-label trial. Lancet. 2010;376(9747):1147-1154. doi: 10.1016/S0140-6736(10)61389-X. Liede A, Arellano J, Hechmati G, et al. International prevalence of nonmetastatic (M0) castration-resistant prostate cancer (CRPC). J Clin Oncol. 2013;31(suppl 15):e16052. ascopubs.org/doi/abs/10.1200/jco.2013.31.15_suppl.e16052. Luo J, Beer TM, Graff JN. 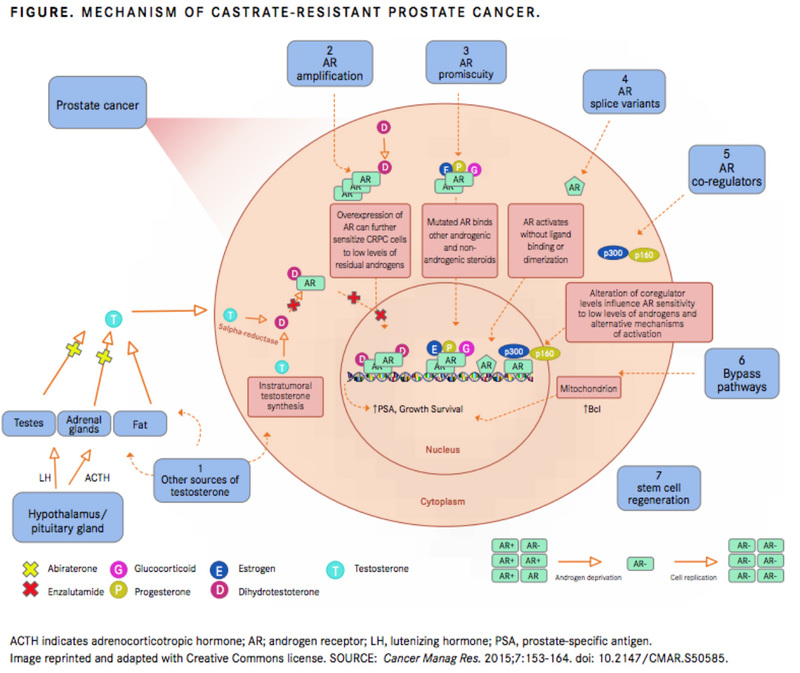 Treatment of nonmetastatic castration-resistant prostate cancer. Oncology (Williston Park). 2016;30(4):336-344. Hussain M, Fizazi K, Saad F, et al. Enzalutamide in men with nonmetastatic, castration-resistant prostate cancer. N Engl J Med. 2018;378(26):2465-2474. doi: 10.1056/NEJMoa1800536. Smith MR, Saad F, Chowdhury S, et al; SPARTAN Investigators. Apalutamide treatment and metastasis-free survival in prostate cancer. N Engl J Med. 2018;378(15):1408-1418. doi: 10.1056/NEJMoa1715546. Smith MR, Mehra M, Nair S, et al. Association of metastasis-free survival (MFS) and overall survival (OS) in nonmetastatic castration-resistant prostate cancer (nmCRPC). J Clin Oncol. 2018;36(suppl; abstr 5032). meetinglibrary.asco.org/record/162025/abstract. Small EJ, Saad F, Zheng Y, et al. Impact of intervening in high-risk nonmetastatic castration-resistant prostate cancer (HRnmCRPC) on metastatic castration-resistant prostate cancer (mCRPC) disease burden. J Clin Oncol. 2018;36(suppl; abstr e17010). meetinglibrary.asco.org/record/161311/abstract. Knowledge Ecology International. Selected drug prices database. docs.google.com/spreadsheets/d/1pNGEybsksMVZ_hZnVKVjS2lrjC2aAnwIyNw5ghSg_us/edit#gid=1327374767. Accessed August 27, 2018. Carroll J. J&J wins snap approval of apalutamide, the first drug OK’d for nonmetastatic prostate cancer. Endpoints News. February 15, 2018. endpts.com/jj-wins-snap-approval-of-apalutamide-the-first-drug-approved-for-nonmetastatic-prostate-cancer/. Accessed August 27, 2018. Antiandrogen therapies for nonmetastatic castration-resistant prostate cancer: effectiveness and value: evidence report. Institute for Clinical and Economic Review website. icer-review.org/wp-content/uploads/2018/08/ICER_Prostate_Cancer_Evidence_Report_082318.pdf. Published August 24, 2018. Accessed August 27, 2018. Smith MR, Saad F, Hussain M, et al. ARASENS: a phase 3 trial of darolutamide in combination with docetaxel for men with metastatic hormone-sensitive prostate cancer (mHSPC). J Clin Oncol. 2018;36(suppl 6; abstr TPS383). doi: 10.1200/JCO.2018.36.6_suppl.TPS383. De Bonos JS, Goh JCH, Ojamaa K, et al. KEYNOTE-199: Pembrolizumab (pembro) for docetaxel-refractory metastatic castration-resistant prostate cancer (mCRPC). J Clin Oncol. 2018;36(suppl; abstr 5007). meetinglibrary.asco.org/record/160540/abstract.